An exclusive interview for the Italian website Tuttocalciatori.net to Cristian Battocchio, 21 years old Italian midfielder born in Argentina, to know something about his experience with Watford and his future. He played the last season on loan from Udinese. How can you judge your last season? “I think my last season has been positive. In the beginning I found some problems to familiarize with a new situation for the language and to settle into a different style of football. But when mister Zola decided to give me the chance to play, I did my best to take advantage from it. I played around 25 matches, really useful to keep on growing up”. 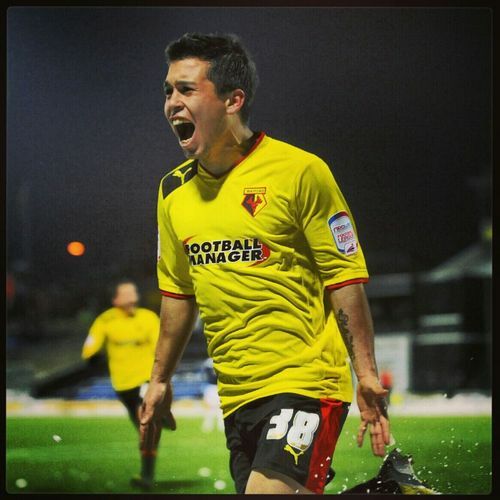 And what about the last season of Watford team? “Very positive. Arriving in final has been a great result for everyone. Gianfranco Zola deserved to create a great group, even with a lot of foreign players”. What kind of trainer is Zola? “He makes you have a good time. Working with him is like becoming kid again: you enjoy yourself training always with the ball and playing football”. Are you remaining at Watford? “I still don’t know. I hope to come back to Watford”. What feelings does the Watford shirt give to you? How do you live the city? Next season goal will be the promotion to Premier League? “Of course it will be the everyone’s aim. If I would remain at Watford, I ‘m sure we will do our best to bring Watford to Premier League”. “They are great! Always with us, at home as away. They surprised me a lot”. A message from you to the supporters? “I thank them a lot for how well they treated me. I hope I’ll come back to go on defending the Hornets!”.